Chrono Trigger[a] is a role-playing video game developed and published by Square for the Super Nintendo Entertainment System in 1995 that began the Chrono series. Chrono Trigger's development team included three designers that Square dubbed the "Dream Team": Hironobu Sakaguchi, the creator of Square's successful Final Fantasy series; Yuji Horii, a freelance designer and creator of Enix's popular Dragon Quest series; and Akira Toriyama, a manga artist famed for his work with Dragon Quest and Dragon Ball. In addition, Kazuhiko Aoki produced the game, Masato Kato wrote most of the story, while composer Yasunori Mitsuda wrote most of the soundtrack before falling ill and deferring the remaining tracks to Final Fantasy series-composer Nobuo Uematsu. The game's story follows a group of adventurers who travel through time to prevent a global catastrophe. Chrono Trigger was a critical and commercial success upon release, and is frequently cited as one of the best video games of all time. Nintendo Power magazine described aspects of Chrono Trigger as revolutionary, including its multiple endings, plot-related side-quests focusing on character development, unique battle system, and detailed graphics. Chrono Trigger was the third best-selling game of 1995 in Japan, and shipped 2.65 million copies worldwide by March 2003. Square released a ported version by Tose in Japan for the PlayStation in 1999, which was later repackaged with a Final Fantasy IV port as Final Fantasy Chronicles (2001) for the North American market. A slightly enhanced Chrono Trigger, again ported by Tose, was released for the Nintendo DS in North America and Japan in 2008, and PAL regions in 2009. The Nintendo DS version sold 790,000 copies by March 2009, after about a year of sales. Chrono Trigger has also been ported to i-mode mobile phones, Virtual Console, the PlayStation Network, iOS devices, Android devices, and Microsoft Windows. Chrono Trigger features standard role-playing video game gameplay. The player controls the protagonist and his companions in the game's two-dimensional fictional world, consisting of various forests, cities, and dungeons. Navigation occurs via an overworld map, depicting the landscape from a scaled-down overhead view. Areas such as forests, cities, and similar places are depicted as more realistic scaled-down maps, in which players can converse with locals to procure items and services, solve puzzles and challenges, or encounter enemies. Chrono Trigger's gameplay deviates from that of traditional Japanese RPGs in that, rather than appearing in random encounters, many enemies are openly visible on field maps or lie in wait to ambush the party. Contact with enemies on a field map initiates a battle that occurs directly on the map rather than on a separate battle screen. Unlike most other role-playing games at the time, combat in Chrono Trigger occurs in the same area where general navigation occurs, with all enemies visible on screen. Players and enemies may use physical or magical attacks to wound targets during battle, and players may use items to heal or protect themselves. Each character and enemy has a certain number of hit points; successful attacks reduce that character's hit points, which can be restored with potions and spells. When a playable character loses all hit points, they faint; if all the player's characters fall in battle, the game ends and must be restored from a previously saved chapter, except in specific storyline-related battles that allow or force the player to lose. Between battles, the player can equip his/her characters with weapons, armor, helmets, and accessories that provide special effects (such as increased attack power or defense against magic), and various consumable items can be used both in and out of battles. Items and equipment can be purchased in shops or found on field maps, often in treasure chests. By exploring new areas and fighting enemies, players progress through Chrono Trigger's story. Chrono Trigger uses an Active Time Battle system—a staple of Square's Final Fantasy game series designed by Hiroyuki Ito for Final Fantasy IV—named "Active Time Battle 2.0." Each character can take action in battle once a personal timer dependent on the character's speed statistic counts to zero. Magic and special physical techniques are handled through a system called "Techs." Techs deplete a character's magic points (a numerical meter similar to hit points), and often have special areas of effect; some spells damage huddled monsters, while others can harm enemies spread in a line. Enemies often change positions during battle, creating opportunities for tactical Tech use. A unique feature of Chrono Trigger's Tech system is that numerous cooperative techniques exist. Each character receives eight personal Techs which can be used in conjunction with others' to create Double and Triple Techs for greater effect. For instance, Crono's sword-spinning Cyclone Tech can be combined with Lucca's Flame Toss to create Flame Whirl. When characters with compatible Techs have enough magic points available to perform their techniques, the game automatically displays the combo as an option. Chrono Trigger features several other distinct gameplay traits, including time travel. Players have access to seven eras of the game world's history, and past actions affect future events. Throughout history, players find new allies, complete side quests, and search for keynote villains. Time travel is accomplished via portals and pillars of light called "time gates", as well as a time machine named Epoch. The game contains thirteen unique endings; the ending the player receives depends on when and how they reach and complete the game's final battle. Chrono Trigger DS features a new ending that can be accessed from the End of Time upon completion of the final extra dungeon and optional final boss. Chrono Trigger also introduces a New Game Plus option; after completing the game, the player may begin a new game with the same character levels, techniques, and equipment, excluding money, with which they ended the previous playthrough. However, certain items central to the storyline are removed and must be found again, such as the sword Masamune. Square has since employed the New Game Plus concept in later titles, including Chrono Cross, Parasite Eve, Vagrant Story, Final Fantasy X-2, and Lightning Returns: Final Fantasy XIII. Chrono Trigger takes place in a world similar to Earth, with eras such as the prehistoric age, in which primitive humans and dinosaurs share the earth; the Middle Ages, replete with knights, monsters, and magic; and the post-apocalyptic future, where destitute humans and sentient robots struggle to survive. The characters frequently travel through time to obtain allies, gather equipment, and learn information to help them in their quest. The party also gains access to the End of Time (represented as year ∞), which serves as a hub to travel back to other time periods. The party eventually acquires a time-machine vehicle known as the Wings of Time, nicknamed the Epoch. The vehicle is capable of time travel between any time period without first having to travel to the End of Time. Chrono Trigger's six playable characters (plus one optional character) come from different eras of history. Chrono Trigger begins in AD 1000 with Crono, Marle, and Lucca. Crono is the silent protagonist, characterized as a fearless young man who wields a katana in battle. Marle, revealed to be Princess Nadia, lives in Guardia Castle; though sheltered, at heart, she's a princess who seeks independence from her royal identity. Lucca is a childhood friend of Crono's and a mechanical genius; her home is filled with laboratory equipment and machinery. From the era of AD 2300 comes Robo, or Prometheus (designation R-66Y), a robot with a near-human personality created to assist humans. Lying dormant in the future, Robo is found and repaired by Lucca, and joins the group out of gratitude. The fiercely confident Ayla dwells in 65,000,000 BC. Unmatched in raw strength, Ayla is the chief of Ioka Village and leads her people in war against a species of humanoid reptiles known as Reptites. The last two playable characters are Frog and Magus. Frog originated in AD 600. He is a former squire once known as Glenn, who was turned into an anthropomorphic frog by Magus, who also killed his friend Cyrus. Chivalrous but mired in regret, Frog dedicates his life to protecting Leene, the queen of Guardia, and avenging Cyrus. Meanwhile, Guardia in AD 600 is in a state of conflict against the Mystics (known as Fiends in the US/DS port), a race of demons and intelligent animals who wage war against humanity under the leadership of Magus, a powerful sorcerer. Magus's seclusion conceals a long-lost past; he was formerly known as Janus, the young prince of the Kingdom of Zeal, which was destroyed by Lavos in 12,000 BC. The incident sent him forward through time, and as he ages, he plots revenge against Lavos and broods over the fate of his sister, Schala. Lavos, the game's main antagonist who awakens and ravages the world in AD 1999, is an extraterrestrial, parasitic creature that harvests DNA and the Earth's energy for its own growth. In AD 1000, Crono and Marle watch Lucca and her father demonstrate her new teleporter at the Millennial Fair. When Marle volunteers to be teleported, her pendant interferes with the device and creates a time portal into which she is drawn. After Crono and Lucca separately recreate the portal and find themselves in AD 600, they find Marle only to see her vanish before their eyes. Lucca realizes that this time period's kingdom has mistaken Marle for an ancestor of hers who had been kidnapped, thus putting off the recovery effort for her ancestor and creating a grandfather paradox. Crono and Lucca, with the help of Frog, restore history to normal by recovering the kidnapped queen. After the three part ways with Frog and return to the present, Crono is arrested on charges of kidnapping the princess and sentenced to death by the current chancellor of Guardia. Lucca and Marle help Crono to flee, haphazardly using another time portal to escape their pursuers. This portal lands them in AD 2300, where they learn that an advanced civilization has been wiped out by a giant creature known as Lavos that appeared in 1999. The three vow to find a way to prevent the future destruction of their world. After meeting and repairing Robo, Crono and his friends find Gaspar, an old sage at the End of Time, who helps them acquire magical powers and travel through time by way of several pillars of light. Research in AD 1000 tells them about Magus summoning Lavos into the world. To repair Frog's sword, the Masamune, they travel to prehistoric times and meet Ayla. After returning to AD 600, they challenge Magus, believing him to be the source of Lavos; after the battle, a summoning spell causes a time gate that throws Crono and his friends to the past. Back in prehistory, Ayla joins the group to battle the Reptites and witness the origin of Lavos. They learn that Lavos was an alien being that arrived on the planet millions of years in the past, and began to absorb DNA and energy from every living creature before arising and razing the planet's surface in 1999 so that it could spawn a new generation. Entering a gate created by the newly-landed Lavos, they go to BC 12,000, an ice age, where the party finds the Kingdom of Zeal, who recently discovered Lavos and seeks to drain its power to achieve immortality through the Mammon Machine. Zeal's leader, Queen Zeal, imprisons Crono and friends on orders of the Prophet, a mysterious figure who has recently begun advising the queen. Though Zeal's daughter Schala frees them, the Prophet forces her to banish them from the realm and seal the time gate they used to travel to the Dark Ages. They return next to AD 2300 to find a time machine called the Wings of Time (or Epoch), which can access any time period without using a time gate. They travel back to BC 12000 to stop Zeal from activating the Mammon Machine in the Ocean Palace. Lavos awakens, disturbed by the Mammon Machine; the Prophet reveals himself to be Magus and unsuccessfully tries to kill the creature. The party is beaten, and a broken Crono stands up to Lavos before being vaporized by a powerful blast. Schala transports the rest of the party back to the surface before Lavos destroys the Ocean palace and the Kingdom of Zeal. Crono's friends awaken in a village and find Magus, who confesses that he used to be Prince Janus of Zeal. In his memories, it is revealed that the disaster at the Ocean Palace scattered the Gurus of Zeal across time and sent him to the Middle Ages. Janus took the alias of Magus and gained a cult of followers while plotting to summon and kill Lavos in revenge for the death of his sister, Schala. When Lavos appeared after his battle with Crono and his allies, he was cast back to the time of Zeal and presented himself to them as a prophet. At this point, Magus is either killed by the party, killed in a duel with Frog, or spared and convinced to join the party. As Crono's friends depart, the ruined Ocean Palace rises into the air as the Black Omen. The group turns to Gaspar for help, and he gives them a "Chrono Trigger," an egg-shaped device that allows the group to replace Crono just before the moment of death with a Dopple Doll. Crono and his friends then gather power by helping people across time with Gaspar's instructions. Their journeys involve defeating the remnants of the Mystics, stopping Robo's maniacal AI creator, addressing Frog's feelings towards Cyrus, locating and charging up the mythical Sun Stone, retrieving the Rainbow Shell, and helping restore a forest destroyed by a desert monster. The group enters the Black Omen and defeats Queen Zeal, then successfully battles Lavos, saving the future of their world. If Magus joined the party, he departs to search for Schala. Crono's mother accidentally enters the time gate at the fair before it closes, prompting Crono, Marle, and Lucca to set out in the Epoch to find her while fireworks light up the night sky. Alternatively, if the party used the Epoch to break Lavos's outer shell, Marle will help her father hang Nadia's bell at the festival and accidentally get carried away by several balloons. Crono jumps on to help her, but cannot bring them down to earth. Hanging on in each other's arms, the pair travel through the cloudy, moonlit sky. Chrono Trigger DS added two new scenarios to the game. In the first, Crono and his friends can help a "lost sanctum" of Reptites, who reward powerful items and armor. The second scenario adds ties to Trigger's sequel, Chrono Cross. In a New Game +, the group can explore several temporal distortions to combat shadow versions of Crono, Marle, and Lucca, and to fight Dalton, who promises in defeat to raise an army in the town of Porre to destroy the Kingdom of Guardia. The group can then fight the Dream Devourer, a prototypical form of the Time Devourer—a fusion of Schala and Lavos seen in Chrono Cross. A version of Magus pleads with Schala to resist; though she recognizes him as her brother, she refuses to be helped and sends him away. Schala subsequently erases his memories and Magus awakens in a forest, determined to find what he had lost. Chrono Trigger was conceived in 1992 by Hironobu Sakaguchi, producer and creator of the Final Fantasy series; Yuji Horii, director and creator of the Dragon Quest series; and Akira Toriyama, character designer of Dragon Quest and creator of the Dragon Ball comics series. Traveling to the United States to research computer graphics, the three decided to create something that "no one had done before". After spending over a year considering the difficulties of developing a new game, they received a call from Kazuhiko Aoki, who offered to produce. The four met and spent four days brainstorming ideas for the game. Square convened 50–60 developers, including scenario writer Masato Kato, whom Square designated story planner. Development started in early 1993. An uncredited Square employee suggested that the team develop a time travel-themed game, which Kato initially opposed, fearing repetitive, dull gameplay. Kato and Horii then met several hours per day during the first year of development to write the game's plot. Square intended to license the work under the Seiken Densetsu franchise and gave it the working title of "Maru Island"; Hiromichi Tanaka (the future director of Chrono Cross) monitored Toriyama's early designs. 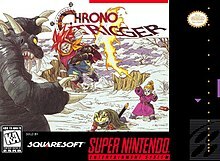 The team hoped to release it on Nintendo's planned Super Famicom Disk Drive; when Nintendo canceled the project, Square reoriented the game for release on a Super Famicom cartridge and rebranded it as Chrono Trigger. Tanaka credited the ROM cartridge platform for enabling seamless transition to battles on the field map. Aoki ultimately produced Chrono Trigger, while director credits were attributed to Akihiko Matsui, Yoshinori Kitase and Takashi Tokita. Toriyama designed the game's aesthetic, including characters, monsters, vehicles, and the look of each era. Masato Kato also contributed character ideas and designs. Kato planned to feature Gaspar as a playable character and Toriyama sketched him, but he was cut early in development. The development staff studied the drawings of Toriyama to approximate his style. Sakaguchi and Horii supervised; Sakaguchi was responsible for the game's overall system and contributed several monster ideas. Other notable designers include Tetsuya Takahashi, the graphic director, and Yasuyuki Honne, Tetsuya Nomura, and Yusuke Naora, who worked as field graphic artists. Yasuhika Kamata programmed graphics, and cited Ridley Scott's visual work in the film Alien as an inspiration for the game's lighting. Kamata made the game's luminosity and color choice lay between that of Secret of Mana and the Final Fantasy series. Features originally intended to be used in Secret of Mana or Final Fantasy IV, also under development at the same time, were appropriated by the Chrono Trigger team. Hironobu Sakaguchi, part of the "Dream Team"
Yuji Horii, a fan of time travel fiction (such as the TV series The Time Tunnel), fostered a theme of time travel in his general story outline of Chrono Trigger with input from Akira Toriyama. Horii liked the scenario of the grandfather paradox surrounding Marle. Concerning story planning, Horii commented, "If there's a fairground, I just write that there's a fairground; I don't write down any of the details. Then the staff brainstorm and come up with a variety of attractions to put in." Sakaguchi contributed some minor elements, including the character Gato; he liked Marle's drama and reconciliation with her father. Masato Kato subsequently edited and completed the outline by writing the majority of the game's story, including all the events of the 12,000 BC era. He took pains to avoid what he described as "a long string of errands ... [such as] 'do this', 'take this', 'defeat these monsters', or 'plant this flag'." Kato and other developers held a series of meetings to ensure continuity, usually attended by around 30 personnel. Kato and Horii initially proposed Crono's death, though they intended he stay dead; the party would have retrieved an earlier, living version of him to complete the quest. Square deemed the scenario too depressing and asked that Crono be brought back to life later in the story. Kato also devised the system of multiple endings because he could not branch the story out to different paths. Yoshinori Kitase and Takashi Tokita then wrote various subplots. They also devised an "Active Time Event Logic" system, "where you can move your character around during scenes, even when an NPC is talking to you", and with players "talking to different people and steering the conversation in different directions", allowing each scene to "have many permutations." Kato became friends with composer Yasunori Mitsuda during development, and they would collaborate on several future projects. Katsuhisa Higuchi programmed the battle system, which hosted combat on the map without transition to a special battleground as most previous Square games had done. Higuchi noted extreme difficulty in loading battles properly without slow-downs or a brief, black loading screen. The game's use of animated monster sprites consumed much more memory than previous Final Fantasy games, which used static enemy graphics. Hironobu Sakaguchi likened the development of Chrono Trigger to "play[ing] around with Toriyama's universe," citing the inclusion of humorous sequences in the game that would have been "impossible with something like Final Fantasy." When Square Co. suggested a non-human player character, developers created Frog by adapting one of Toriyama's sketches. The team created the End of Time to help players with hints, worrying that they might become stuck and need to consult a walkthrough. The game's testers had previously complained that Chrono Trigger was too difficult; as Horii explained, "It's because we know too much. The developers think the game's just right; that they're being too soft. They're thinking from their own experience. The puzzles were the same. Lots of players didn't figure out things we thought they'd get easily." Sakaguchi later cited the unusual desire of beta testers to play the game a second time or "travel through time again" as an affirmation of the New Game + feature: "Wherever we could, we tried to make it so that a slight change in your behavior caused subtle differences in people's reactions, even down to the smallest details ... I think the second playthrough will hold a whole new interest." The game's reuse of locations due to time traveling made bug-fixing difficult, as corrections would cause unintended consequences in other eras. A 30-second sample of the theme of Chrono Trigger, illustrating the game's aural style and aesthetic. A 30-second sample of Zeal Palace from The Brink of Time, demonstrating the acid-jazz style of the arranged album. Chrono Trigger was scored primarily by Yasunori Mitsuda, with contributions from veteran Final Fantasy composer Nobuo Uematsu, and one track composed by Noriko Matsueda. A sound programmer at the time, Mitsuda was unhappy with his pay and threatened to leave Square if he could not compose music. Hironobu Sakaguchi suggested he score Chrono Trigger, remarking, "maybe your salary will go up." Mitsuda composed new music and drew on a personal collection of pieces composed over the previous two years. He reflected, "I wanted to create music that wouldn't fit into any established genre ... music of an imaginary world. The game's director, Masato Kato, was my close friend, and so I'd always talk with him about the setting and the scene before going into writing." Mitsuda slept in his studio several nights, and attributed certain pieces—such as the game's ending theme, To Far Away Times—to inspiring dreams. He later attributed this song to an idea he was developing before Chrono Trigger, reflecting that the tune was made in dedication to "a certain person with whom [he] wanted to share a generation". He also tried to use leitmotifs of the Chrono Trigger main theme to create a sense of consistency in the soundtrack. Mitsuda wrote each tune to be around two minutes long before repeating, unusual for Square's games at the time. Mitsuda suffered a hard drive crash that lost around forty in-progress tracks. After Mitsuda contracted stomach ulcers, Uematsu joined the project to compose ten pieces and finish the score. Mitsuda returned to watch the ending with the staff before the game's release, crying upon seeing the finished scene. Yasunori Mitsuda composed the bulk of the music for Chrono Trigger and would later serve as composer for Chrono Cross. I feel that the way we interact with music has changed greatly in the last 13 years, even for me. For better or for worse, I think it would be extremely difficult to create something as "powerful" as I did 13 years ago today. But instead, all that I have learned in these 13 years allows me to compose something much more intricate. To be perfectly honest, I find it so hard to believe that songs from 13 years ago are loved this much. Keeping these feelings in mind, I hope to continue composing songs which are powerful, and yet intricate...I hope that the extras like this bonus CD will help expand the world of Chrono Trigger, especially since we did a live recording. I hope there's another opportunity to release an album of this sort one day. Music from the game was performed live by the Tokyo Symphony Orchestra in 1996 at the Orchestral Game Concert in Tokyo, Japan. A suite of music including Chrono Trigger is a part of the symphonic world-tour with video game music Play! A Video Game Symphony, where Mitsuda was in attendance for the concert's world-premiere in Chicago on May 27, 2006. His suite of Chrono music, comprising "Reminiscence", "Chrono Trigger", "Chrono Cross~Time's Scar", "Frog's Theme", and "To Far Away Times" was performed. Mitsuda has also appeared with the Eminence Symphony Orchestra as a special guest. Video Games Live has also featured medleys from Chrono Trigger and Chrono Cross. A medley of Music from Chrono Trigger made of one of the four suites of the Symphonic Fantasies concerts in September 2009 which was produced by the creators of the Symphonic Game Music Concert series, conducted by Arnie Roth. Square Enix re-released the game's soundtrack, along with a video interview with Mitsuda in July 2009. The team planned to release Chrono Trigger in late 1994, but release was pushed back to the following year. Early alpha versions of Chrono Trigger were demonstrated at the 1994 and 1995 V-Jump festivals in Japan. A few months prior to the game's release, Square shipped a beta version to magazine reviewers and game stores for review. An unfinished build of the game dated November 17, 1994, it contains unused music tracks, locations, and other features changed or removed from the final release—such as a dungeon named "Singing Mountain" and its eponymous tune. Some names also differed; the character Soysaw (Slash in the US version) was known as Wiener, while Mayonnay (Flea in the US version) was named Ketchappa. The ROM image for this early version was eventually uploaded to the internet, prompting fans to explore and document the game's differences, including two unused world map NPC character sprites and presumed additional sprites for certain non-player characters. Around the game's release, Yuji Horii commented that Chrono Trigger "went beyond [the development team's] expectations", and Hironobu Sakaguchi congratulated the game's graphic artists and field designers. Sakaguchi intended to perfect the "sense of dancing you get from exploring Toriyama's worlds" in the event that they would make a sequel. Chrono Trigger used a 32-megabit ROM cartridge with battery-backed RAM for saved games, lacking special on-cartridge coprocessors. The Japanese release of Chrono Trigger included art for the game's ending and running counts of items in the player's status menu. Developers created the North American version before adding these features to the original build, inadvertently leaving in vestiges of Chrono Trigger's early development (such as the piece "Singing Mountain"). Hironobu Sakaguchi asked translator Ted Woolsey to localize Chrono Trigger for English audiences and gave him roughly thirty days to work. Lacking the help of a modern translation team, he memorized scenarios and looked at drafts of commercial player's guides to put dialogue in context. Woolsey later reflected that he would have preferred two-and-a-half months, and blames his rushed schedule on the prevailing attitude in Japan that games were children's toys rather than serious works. Some of his work was cut due to space constraints, though he still considered Trigger "one of the most satisfying games [he] ever worked on or played". Nintendo of America censored certain dialogue, including references to breastfeeding, consumption of alcohol, and religion. The original SNES edition of Chrono Trigger was released on the Wii download service Virtual Console in Japan on April 26, 2011, in the US on May 16, 2011, and in Europe on May 20, 2011. Previously in April 2008, a Nintendo Power reader poll had identified Chrono Trigger as the third-most wanted game for the Virtual Console. It went on to receive a perfect score of 10 out 10 on IGN. Square released an enhanced port of Chrono Trigger developed by Tose in Japan for the Sony PlayStation in 1999. Square timed its release before that of Chrono Cross, the 1999 sequel to Chrono Trigger, to familiarize new players with story leading up to it. This version included anime cutscenes created by original character designer Akira Toriyama's Bird Studio and animated by Toei Animation, as well as several bonus features, accessible after achieving various endings in the game. Scenarist Masato Kato attended planning meetings at Bird Studio to discuss how the ending cutscenes would illustrate subtle ties to Chrono Cross. The port was later released in North America in 2001—along with a newly translated version of Final Fantasy IV—under the package title Final Fantasy Chronicles. Reviewers criticized Chronicles for its lengthy load times and an absence of new in-game features. This same iteration was also re-released as a downloadable game on the PlayStation Network on October 4, 2011, for the PlayStation 3, PlayStation Vita, and PlayStation Portable. On July 2, 2008, Square Enix announced that they were planning to bring Chrono Trigger to the Nintendo DS handheld platform. Composer Yasunori Mitsuda was pleased with the project, exclaiming "finally!" after receiving the news from Square Enix and maintaining, "it's still a very deep, very high-quality game even when you play it today. I'm very interested in seeing what kids today think about it when they play it." Square retained Masato Kato to oversee the port, and Tose to program it. Kato explained, "I wanted it to be based on the original Super NES release rather than the PlayStation version. I thought we should look at the additional elements from the Playstation version, re-examine and re-work them to make it a complete edition. That's how it struck me and I told the staff so later on." Square Enix touted the game by displaying Akira Toriyama's original art at the 2008 Tokyo Game Show. The DS re-release contains all of the bonus material from the PlayStation port, as well as other enhancements. The added features include a more accurate and revised translation by Tom Slattery, a dual-screen mode which clears the top screen of all menus, a self-completing map screen, and a default "run" option. It also featured the option to choose between two control schemes: one mirroring the original SNES controls, and the other making use of the DS's touch screen. Masato Kato participated in development, overseeing the addition of the monster-battling Arena, two new areas, the Lost Sanctum and the Dimensional Vortex, and a new ending that further foreshadows the events of Chrono Cross. One of the areas within the Vortex uses the "Singing Mountain" song that was featured on the original Chrono Trigger soundtrack. These new dungeons met with mixed reviews; GameSpot called them "frustrating" and "repetitive", while IGN noted that "the extra quests in the game connect extremely well." It was a nominee for "Best RPG for the Nintendo DS" in IGN's 2008 video game awards. The Nintendo DS version of Chrono Trigger was the 22nd best-selling game of 2008 in Japan. A cellphone version was released in Japan on i-mode distribution service on August 25, 2011. An iOS version was released on December 8, 2011. This version is based on the Nintendo DS version, with graphics optimized for iOS. The game was later released for Android on October 29, 2012. An update incorporating most of the features of the Windows version—including the reintroduction of the animated cutscenes, which had been absent from the initial mobile release—was released on February 27, 2018. Square Enix released Chrono Trigger without an announcement for Microsoft Windows via Steam on February 27, 2018. This version includes all content from the Nintendo DS port, the improved graphics from the mobile device releases, support for mouse and keyboard controls, and autosave features, along with additional content such as wallpapers and music. The PC port received negative reception due to its inferior graphical quality, additional glitches, UI adapted for touchscreens, and failure to properly adapt the control scheme for keyboards and controllers. In response, Square Enix provided various UI updates and other improvements over the next few months to address the complaints. The game was a bestseller in Japan. The game's SNES and PS1 iterations have shipped more than 2.36 million copies in Japan and 290,000 abroad. The first two million copies sold in Japan were delivered in only two months, and the game ended 1995 as the third best-selling game of the year behind Dragon Quest VI: Realms of Revelation and Donkey Kong Country 2: Diddy's Kong Quest. The game was met with substantial success upon release in North America, and its rerelease on the PlayStation as part of the Final Fantasy Chronicles package topped the NPD TRSTS PlayStation sales charts for over six weeks. This version was later re-released again in 2003 as part of Sony's Greatest Hits line. Chrono Trigger DS has sold 490,000 copies in Japan, 240,000 in North America and 60,000 in Europe as of March 2009. Chrono Trigger garnered much critical praise in addition to its brisk sales. Famicom Tsūshin gave Chrono Trigger first an 8 out of 10 and later a 9 out of 10 in their Reader Cross Review. Nintendo Power compared it favorably with Secret of Mana, Final Fantasy, and The Legend of Zelda: A Link to the Past, citing improved graphics, sound, story and gameplay over past RPG titles. GamePro praised the varied gameplay, the humor, the ability to replay the game with previously built-up characters, and the graphics, which they said far exceed even those of Final Fantasy VI. They commented that combat is easier and more simplistic than in most RPGs, but argued that "Most players would choose an easier RPG of this caliber over a hundred more complicated, but less developed, fantasy role-playing adventures." They gave the game a perfect 5 out of 5 in all four categories: graphics, sound, control, and funfactor. Electronic Gaming Monthly gave it their "Game of the Month" award, with their four reviewers praising the graphics, story, and music. Chrono Trigger won multiple awards from Electronic Gaming Monthly's 1995 video game awards, including Best Role-Playing Game, Best Music in a Cartridge-Based Game, and Best Super NES Game. Official U.S. PlayStation Magazine described Trigger as "original and extremely captivating", singling out its graphics, sound and story as particularly impressive. IGN commented that "it may be filled with every imaginable console RPG cliché, but Chrono Trigger manages to stand out among the pack" with "a [captivating] story that doesn't take itself too serious [sic]" and "one of the best videogame soundtracks ever produced". Other reviewers (such as the staff of RPGFan and RPGamer) have criticized the game's short length and relative ease compared to its peers. Victoria Earl of Gamasutra praised the game design for balancing "developer control with player freedom using carefully-designed mechanics and a modular approach to narrative." Overall, critics lauded Chrono Trigger for its "fantastic yet not overly complex" story, simple but innovative gameplay, and high replay value afforded by multiple endings. Online score aggregator GameRankings lists the original Super NES version as the 2nd highest scoring RPG and 24th highest scoring game ever reviewed. In 2009, Guinness World Records listed it as the 32nd most influential video game in history. Nintendo Power listed the ending to Chrono Trigger as one of the greatest endings in Nintendo history, due to over a dozen endings that players can experience. Tom Hall drew inspiration from Chrono Trigger and other console games in creating Anachronox, and used the campfire scene to illustrate the dramatic depth of Japanese RPGs. Next Generation reviewed the Super NES version of the game, rating it four stars out of five, and stated that "it [...] easily qualifies as one of the best RPG's ever made". Chrono Trigger is frequently listed among the greatest video games of all time. It has placed highly on all six of multimedia website IGN's "top 100 games of all time" lists—4th in 2002, 6th in early 2005, 13th in late 2005, 2nd in 2006, 18th in 2007, and 2nd in 2008. Game Informer called it its 15th favourite game in 2001. Its staff thought that it was the best non-Final Fantasy title Square had produced at the time. GameSpot included Chrono Trigger in "The Greatest Games of All Time" list released in April 2006, and it also appeared as 28th on an "All Time Top 100" list in a poll conducted by Japanese magazine Famitsu the same year. In 2004, Chrono Trigger finished runner up to Final Fantasy VII in the inaugural GameFAQs video game battle. In 2008, readers of Dengeki Online voted it the eighth best game ever made. Nintendo Power's twentieth anniversary issue named it the fifth best Super NES game. In 2012, it came 32nd place on GamesRadar's "100 best games of all time" list, and 1st place on its "Best JRPGs" list. GamesRadar named Chrono Trigger the 2nd best Super NES game of all time, behind Super Metroid. In contrast to the critical acclaim of Chrono Trigger's original SNES release, the 2018 Microsoft Windows port of Chrono Trigger was critically panned. Grievances noted by reviewers included tiling errors on textures, the addition of aesthetically-intrusive sprite filters, an unattractive GUI carried over from the 2011 mobile release, a lack of graphic customization options, and the inability to remap controls. In describing the port, Forbes commented: "From pretty awful graphical issues, such as tiling textures and quite a painful menu system, this port really doesn’t do this classic game justice." USGamer characterized the Windows release as carrying "all the markings of a project farmed out to the lowest bidder. It's a shrug in Square-Enix's mind, seemingly not worth the money or effort necessary for a half-decent port." In a Twitter post detailing his experiences with the Windows version, indie developer Fred Wood derisively compared the port to "someone's first attempt at an RPG Maker game", a comment which was republished across numerous articles addressing the poor quality of the rerelease. Chrono Trigger inspired several related releases; the first were three titles released for the Satellaview on July 31, 1995. They included Chrono Trigger: Jet Bike Special, a racing video game based on a minigame from the original; Chrono Trigger: Character Library, featuring profiles on characters and monsters from the game; and Chrono Trigger: Music Library, a collection of music from the game's soundtrack. The contents of Character Library and Music Library were later included as extras in the PlayStation rerelease of Chrono Trigger. Production I.G created a 16-minute OVA entitled "Nuumamonja: Time and Space Adventures" which was shown at the Japanese V-Jump Festival of July 31, 1996. There have been two notable attempts by Chrono Trigger fans to unofficially remake parts of the game for PC with a 3D graphics engine. Chrono Resurrection, an attempt at remaking ten small interactive cut scenes from Chrono Trigger, and Chrono Trigger Remake Project, which sought to remake the entire game, were forcibly terminated by Square Enix by way of a cease and desist order. Another group of fans created a sequel via a ROM hack of Chrono Trigger called Chrono Trigger: Crimson Echoes; developed from 2004 to 2009; although feature-length and virtually finished, it also was terminated through a cease & desist letter days before its May 2009 release. The letter also banned the dissemination of existing Chrono Trigger ROM hacks and documentation. After the cease and desist was issued, an incomplete version of the game was leaked in May 2009, though due to the early state of the game, playability was limited. This was followed by a more complete ROM leak in January 2011, which allowed the game to be played from beginning to end. Square released a fourth Satellaview game in 1996, named Radical Dreamers: Nusumenai Hōseki. Having thought that Trigger ended with "unfinished business", scenarist Masato Kato wrote and directed the game. Dreamers functioned as a side story to Chrono Trigger, resolving a loose subplot from its predecessor. A short, text-based game relying on minimal graphics and atmospheric music, the game never received an official release outside Japan—though it was translated by fans to English in April 2003. Square planned to release Radical Dreamers as an easter egg in the PlayStation edition of Chrono Trigger, but Kato was unhappy with his work and halted its inclusion. Square released Chrono Cross for the Sony PlayStation in 1999. Cross is a sequel to Chrono Trigger featuring a new setting and cast of characters. Presenting a theme of parallel worlds, the story followed the protagonist Serge—a teenage boy thrust into an alternate reality in which he died years earlier. With the help of a thief named Kid, Serge endeavors to discover the truth behind his apparent death and obtain the Frozen Flame, a mythical artifact. Regarded by writer and director Masato Kato as an effort to "redo Radical Dreamers properly", Chrono Cross borrowed certain themes, scenarios, characters, and settings from Dreamers. Yasunori Mitsuda also adapted certain songs from Radical Dreamers while scoring Cross. Radical Dreamers was consequently removed from the series' main continuity, considered an alternate dimension. Chrono Cross shipped 1.5 million copies and was almost universally praised by critics. There are no plans for a new title, despite a statement from Hironobu Sakaguchi in 2001 that the developers of Chrono Cross wanted to make a new Chrono game. The same year, Square applied for a trademark for the names Chrono Break in the United States and Chrono Brake in Japan. However, the United States trademark was dropped in 2003. Director Takashi Tokita mentioned "Chrono Trigger 2" in a 2003 interview which has not been translated to English. Yuji Horii expressed no interest in returning to the Chrono franchise in 2005, while Hironobu Sakaguchi remarked in April 2007 that his creation Blue Dragon was an "extension of [Chrono Trigger]." During a Cubed³ interview on February 1, 2007, Square Enix's Senior Vice President Hiromichi Tanaka said that although no sequel is currently planned, some sort of sequel is still possible if the Chrono Cross developers can be reunited. Yasunori Mitsuda has expressed interest in scoring a new game, but warned that "there are a lot of politics involved" with the series. He stressed that Masato Kato should participate in development. The February 2008 issue of Game Informer ranked the Chrono series eighth among the "Top Ten Sequels in Demand", naming the games "steadfast legacies in the Square Enix catalogue" and asking, "what's the damn holdup?!" In Electronic Gaming Monthly's June 2008 "Retro Issue", writer Jeremy Parish cited Chrono as the franchise video game fans would be most thrilled to see a sequel to. In the first May Famitsu of 2009, Chrono Trigger placed 14th out of 50 in a vote of most-wanted sequels by the magazine's readers. At E3 2009, SE Senior Vice President Shinji Hashimoto remarked, "If people want a sequel, they should buy more!" In July 2010, Feargus Urquhart, replying to an interview question about what franchises he would like to work on, said that "if [he] could come across everything that [he] played", he would choose a Chrono Trigger game. At the time, Urquhart's company Obsidian Entertainment was making Dungeon Siege III for Square Enix. Urquhart said: "You make RPGs, we make RPGs, it would be great to see what we could do together. And they really wanted to start getting into Western RPGs. And, so it kind of all ended up fitting together." Yoshinori Kitase revealed in 2011 that he used the time travel mechanics of Chrono Trigger as a starting point for that of Final Fantasy XIII-2. ^ Japanese: クロノ・トリガー, Hepburn: Kurono Torigā? ^ a b c d e f g V-Jump Festival 1994 (VHS tape). Japan: Shueisha. 1994. Archived from the original on January 3, 2008. ^ a b c d e f g h i j k l m n o Studio BentStuff, ed. (2009). Chrono Trigger Ultimania (in Japanese). Square Enix. p. 581. ISBN 978-4-7575-2469-9. Archived from the original on November 19, 2010. ^ a b c d e f g "Procyon Studio: Interview with Masato Kato". Cocoebiz.com. November 1999. Archived from the original on July 24, 2011. Retrieved June 3, 2007. ^ "Chrono Trigger". Nintendo of America. Archived from the original on October 19, 2007. ^ "Chrono Trigger Multiplayer Hands-on". 2008. Archived from the original on June 26, 2011. Retrieved May 4, 2011. ^ Square Co. (August 22, 1995). Chrono Trigger. Super NES. Square Soft. Keizo Kokubo: Well then, open the Gates to the Dream Team! ... / Developer's Ending: Cheers! You made it to one of the endings! You're now a member of the Dream Team! ^ a b c d Kohler, Chris (2004). Power-Up: How Japanese Video Games Gave the World an Extra Life. DK Publishing. ISBN 0-7440-0424-1. ^ a b c "Epic Center: Chrono Trigger". Nintendo Power. 74: &nbsp, 52. July 1995. ^ a b "販売本数ランキング". ゲームランキング. Archived from the original on August 2, 2012. Retrieved December 12, 2018. ^ a b c "February 2, 2004 - February 4, 2004" (PDF). Square Enix. February 9, 2004. p. 27. Archived (PDF) from the original on February 13, 2012. Retrieved December 12, 2018. ^ "Chrono Trigger for Nintendo DS". Square Enix. Archived from the original on May 10, 2013. Retrieved February 16, 2009. ^ a b "Results Briefing Session for the Fiscal Year ended March 31, 2009" (PDF). Square Enix. May 25, 2009. p. 28. Archived (PDF) from the original on August 5, 2015. Retrieved July 16, 2010. ^ "Chrono Trigger | Square Enix". Square Enix. January 2011. Archived from the original on February 19, 2011. Retrieved February 2, 2011. ^ a b "Chrono Trigger Time Warps to Virtual Console Next Month | Siliconera". Siliconera.com. March 2011. Archived from the original on April 2, 2011. Retrieved March 26, 2011. ^ "Chrono Trigger Coming to PS3". Archived from the original on April 28, 2011. Retrieved April 22, 2011. ^ "TGS '11: Square Enix announces Chrono Trigger for iOS and Android, Dragon Quest Monsters and Ithadaki Street also revealed". Pocket Gamer. September 16, 2011. Archived from the original on December 20, 2016. ^ "Square Enix Market - Chrono Trigger". Square Enix. 2011. Archived from the original on June 20, 2012. Retrieved June 25, 2012. ^ Schreier, Jason (February 27, 2018). "Chrono Trigger Gets Surprise Release On PC". Kotaku. Archived from the original on February 27, 2018. Retrieved February 27, 2018. ^ a b "Epic Center: Chrono Trigger". Nintendo Power. 74: &nbsp, 53. July 1995. ^ "Chrono Trigger: A New Standard for RPGs". Nintendo Power. 73: &nbsp, 37. June 1995. ^ a b Final Fantasy Chronicles instruction manual. Square Enix. 2001. pp. &nbsp, 32–33. SLUS-01363. ^ Square Co (August 22, 1995). Chrono Trigger. Super NES. Square Soft. Level/area: Heckran Cave. Heckran: If only the great Magus who brought forth Lavos 400 years ago, had destroyed the human race! ^ Square Co (August 22, 1995). Chrono Trigger. Super NES. Square Soft. Level/area: Heckran Cave. Magus: I've waited for this... I've been waiting for you, Lavos. I swore long ago... that I'd destroy you! No matter what the price! It is time to fulfill that vow. Feel my wrath, Lavos!! ... / Magus: Aaah!! My powers are being drained! ^ Square Co (August 22, 1995). Chrono Trigger. Super NES. Square Soft. Level/area: North Cape. Magus: Behold. Everything's at the bottom of the sea. Gone is the magical kingdom of Zeal, and all the dreams and ambitions of its people. I once lived there... But I was another person then. ... / Marle: You're... ...Janus, aren't you? ... / Magus: Ever since Lavos's time portal stranded me in the Middle Ages... I have waited to even the score. ^ Square Co (August 22, 1995). Chrono Trigger. Super NES. Square Soft. Level/area: The End of Time. Gaspar: Just as you touch the lives of every life form you meet, so, too, will their energy strengthen you. ^ Square Co (August 22, 1995). Chrono Trigger. Super NES. Square Soft. Level/area: Geno Dome. Mother Brain: Listen well humans. ... / Mother Brain: We robots will create a new order... A nation of steel, and pure logic. A true paradise! Our «Species» will replace you... So stop your foolish struggle, and succumb to the sleep of eternity... ... / Marle: What IS this?! We have to do something! / Magus: Hmm... A human processing plant? / Frog: What be this?! We must rescue them! ^ Square Co (August 22, 1995). Chrono Trigger. Super NES. Square Soft. Level/area: Northern Ruins. Frog: Dear Cyrus... Thou must...think ill of me. / Cyrus: On the contrary! You have come far, my friend. When Magus defeated me, I thought of all those whom I had left behind. King Guardia, Queen Leene, and of course, you... Your skill and dedication is superior! I can rest now, knowing that everyone is in good hands. Good bye, my friend! ^ Square Co (August 22, 1995). Chrono Trigger. Super NES. Square Soft. Level/area: Fiona's Forest. Robo: After 400 years of experience, I have come to think that Lavos may not be responsible for the Gates. / Marle: What do you mean? / Robo: I have come to think that someone, or something wanted us to see all this. ^ Square Co (August 22, 1995). Chrono Trigger. Super NES. Square Soft. Level/area: Leene Square. Mom: Look, Crono! Your cat's running away because you haven't been feeding it! Hey, come back here! / Marle: Oh, great! Crono, that Gate will never open again! / Lucca: Well it looks like we have no choice but to go after them! / Marle: Go after them?! But the Gate's... Lucca, don't turn off your brain, yet! / Lucca: I forgot! We have a Time Machine! ^ Square Enix (November 25, 2008). Chrono Trigger DS. Nintendo DS. Square Enix. Level/area: Twilight Grotto. Dalton: If it weren't for you, I'd have been the ruler of an age all my own! You robbed me of everything I'd worked so hard for! My wealth, my home, my loyal underlings... You took it all away! It's unforgivable! So come on! Have a taste of the suffering I've endured because of you! / Dalton: Hmph. I think that's enough for today. But don't you dare think this is settled! Just you wait! I'll raise the greatest army the world has ever seen in Porre, and use it to wipe your pitiful little kingdom off the map! ^ Square Enix (November 25, 2008). Chrono Trigger DS. Nintendo DS. Square Enix. Level/area: Twilight Grotto. Magus: Hmph. If this is to be the way of things, then let me abandon all that was and fade away as well. Should a part of me somehow even then remain, then perhaps that will be the birth of something new—something with greater meaning than all this. / Magus: Who...who am I? What's happened? I...I don't remember anything. There was something...something I needed to do. Something I needed to...to find. / Magus: I must find a way to remember. I will. ^ "Prescreen: Chrono Trigger". Edge. Bath: Future Publishing (19): 41. April 1995. ^ a b c Seiken Densetsu Music Complete Book Liner Notes (translated by Gerardo Iuliani). Square Enix. September 14, 2011. Archived from the original on August 9, 2014. ^ V-Jump, ed. (1995). Chrono Trigger V-Jump Player's Guide (in Japanese). V-Jump. p. 189. ^ a b c d e f g h i j k l m V-Jump, ed. (1995). Chrono Trigger: The Perfect [Translation] (in Japanese). Shueisha. p. 290. Archived from the original on March 6, 2016. ^ Square Co (August 22, 1995). Chrono Trigger (Credits). Super NES. Square Soft. ^ a b c d e f g h "Chrono Trigger Development Team Special Talk". Gamest. Shinseisha: 211–215. March 1995. Archived from the original on November 19, 2010. ^ Schaulfelberger, Frederik (September 2006). "Sanningen om Mana". Level (in Swedish). IDG (6): 114–121. ^ Play staff. "Yuji Horii interview". Play online. Archived from the original on March 25, 2006. Retrieved February 16, 2007. ^ a b c d e Studio BentStuff, ed. (1999). Chrono Cross Ultimania (in Japanese). Square Enix. pp. 476–477. ISBN 4-925075-73-X. Archived from the original on April 18, 2009. ^ a b c "Weekly Famitsu". Chrono Compendium. 1999. Archived from the original on July 21, 2006. Retrieved July 3, 2006. ^ "Chrono Trigger: 1994/1995 Developer Interviews". Shmuplations. 1994. Archived from the original on April 11, 2017. Retrieved February 14, 2017. ^ a b c Kennedy, Sam (January 28, 2008). "Radical Dreamer: Yasunori Mitsuda Interview from 1UP.com". 1UP.com. Archived from the original on December 5, 2012. Retrieved February 8, 2008. ^ a b c d "Chrono Trigger DS" (Flash). Square Enix. Archived from the original on February 26, 2009. Retrieved March 13, 2009. ^ a b c d e "Yasunori Mitsuda Talks Chrono Trigger". Original Sound Version. November 24, 2008. Archived from the original on March 24, 2011. Retrieved March 13, 2009. ^ a b c d "Chrono Trigger DS". Famitsu (in Japanese): &nbsp, 67–70. 2008. Archived from the original on June 13, 2009. ^ Gay, James (October 13, 2006). "Yasunori Mitsuda Interview". PALGN. Archived from the original on February 3, 2014. Retrieved May 22, 2007. ^ Driker, Brandon (May 30, 2006). "Play! A Video Game Symphony". N-Sider. Archived from the original on January 25, 2013. Retrieved January 7, 2009. ^ "Chrono Trigger Fan Club". Square Enix. Archived from the original on February 19, 2009. Retrieved February 20, 2009. ^ "Passion by Eminence Symphony Orchestra Review". January 13, 2007. Archived from the original on October 29, 2013. Retrieved April 26, 2014. ^ David Hsu (April 8, 2009). "Video Games Live Pulls the Trigger: Chrono Medley Added to Repertoire". Original Sound Version. Retrieved August 10, 2009. ^ Music from classic games arranged by Jonne Valtonen. Symphonic Fantasies. January 22, 2009. Archived from the original on June 27, 2009. Retrieved June 1, 2009. ^ "[DS版]クロノ・トリガー オリジナル・サウンドトラック(DVD付) [CD+DVD]". July 29, 2009. Archived from the original on March 19, 2015. Retrieved July 30, 2009. ^ "Alpha Versions". Chrono Compendium. Archived from the original on January 3, 2008. Retrieved January 14, 2008. ^ a b Square Co (November 17, 1994). Chrono Trigger (Prerelease). Super NES. Square Soft. ^ Square Co (November 17, 1994). Chrono Trigger (Prerelease). Super NES. Square Soft. Level/area: Singing Mountain. ^ a b "Translation Differences". Chrono Compendium. April 2007. Archived from the original on February 5, 2008. Retrieved February 8, 2008. ^ Yasunori Mitsuda. "Singing Mountain (Music)". Chrono Compendium. Archived from the original on April 26, 2007. Retrieved April 2, 2007. ^ a b c d Ted Woolsey (February 16, 2007). "Interview with Ted Woolsey". Player One Podcast. Archived from the original on January 27, 2011. Retrieved January 14, 2008. ^ Ted Woolsey, Bob Rork. "Interview with Ted Woolsey". Chrono Compendium. Archived from the original on July 13, 2006. Retrieved April 2, 2007. ^ IGN. "Chrono Trigger Wii-Bound in America". Archived from the original on June 13, 2012. Retrieved May 13, 2011. ^ nintendolife. "Chrono Trigger Hits European Virtual Console on Friday". Archived from the original on May 19, 2011. Retrieved May 20, 2011. ^ "Wii Channels: Wanted!". Nintendo Power. Future US. 229: 25. June 2008. ^ a b Thomas, Lucas. "Chrono Trigger Review". IGN. Archived from the original on May 28, 2011. Retrieved May 26, 2011. ^ a b Sam Kennedy, ed. (August 2001). "Chrono Trigger". Official U.S. PlayStation Magazine. Ziff Davis Media Inc. (47): &nbsp, 107. ^ Shoemaker, Brad (June 6, 2001). "Final Fantasy Chronicles for PlayStation Review". GameSpot. Archived from the original on September 4, 2015. Retrieved December 27, 2008. ^ "Chrono Trigger Hits PSN This Tuesday". PlayStation.Blog. Archived from the original on September 7, 2015. ^ "【ブースリポート】スクウェア・エニックスブースでは『FFXIII』ほかの最新映像を上映". Famitsu. October 9, 2008. Archived from the original on October 12, 2008. Retrieved October 13, 2008. ^ Tong, Sophia (July 16, 2008). "E3 2008: Chrono Trigger DS Hands-On". GameSpot. Archived from the original on February 2, 2012. Retrieved October 2, 2008. ^ Cheng, Justin (October 2008). "The Big 15: Chrono Trigger". Nintendo Power. Future US. 233: &nbsp, 62. ^ Square Enix (November 25, 2008). Chrono Trigger DS. Nintendo DS. Square Enix. ^ O'Connor, Michael (September 21, 2008). "Chrono Trigger DS receives Monster Battling addition". The Gaming Vault. Archived from the original on September 24, 2008. Retrieved October 1, 2008. ^ "ニンテンドーDS版の追加要素が判明 『クロノ･トリガー』". Famitsu. October 7, 2008. Archived from the original on October 9, 2008. Retrieved October 13, 2008. ^ a b Anderson, Lark (November 21, 2008). "Chrono Trigger Review". Gamespot.com. Archived from the original on March 26, 2014. Retrieved April 26, 2014. ^ a b Bozon, Mark (November 20, 2008). "Chrono Trigger for DS review". IGN. Archived from the original on December 5, 2008. Retrieved December 8, 2008. ^ "IGN DS: Best RPG 2008". IGN.com. December 15, 2008. Archived from the original on December 19, 2008. Retrieved April 26, 2014. ^ "JAPANESE 2008 MARKET REPORT". MCV. Archived from the original on January 22, 2009. Retrieved January 9, 2009. ^ "スクエニ、iモード「クロノ・トリガー」時をめぐる壮大な物語が展開する名作RPG" (in Japanese). Game Watch. Archived from the original on May 14, 2013. Retrieved May 15, 2013. ^ "ChĜrono Trigger iOS Available Now". IGN. Archived from the original on February 20, 2014. Retrieved May 15, 2013. ^ "Oh Man,ChronoTrigger Is On Android Now For $10- This Is Even Better Than Final Fantasy". Android police. Archived from the original on May 8, 2013. Retrieved May 15, 2013. ^ "スクエニ、「クロノ・トリガー」 Android/EZweb版も配信開始!!" (in Japanese). Game Watch. Archived from the original on May 14, 2013. Retrieved May 15, 2013. ^ Allegra, Frank (February 27, 2018). "Now play one of the best RPGs ever on your PC". Polygon. Archived from the original on February 27, 2018. Retrieved February 27, 2018. ^ Kuchera, Ben (February 27, 2018). "Chrono Trigger fans can't stand its PC port". Polygon. Archived from the original on February 28, 2018. Retrieved March 2, 2018. ^ Donaldson, Alex (March 1, 2018). "Chrono Trigger on PC is a perfect example of how to not re-release a classic game". VG247. Archived from the original on March 2, 2018. Retrieved March 2, 2018. ^ Barder, Ollie (February 28, 2018). "The Classic 'Chrono Trigger' Has Been Ported To PC And It's Not Good At All". Forbes. Archived from the original on February 28, 2018. Retrieved March 2, 2018. ^ Schreier, Jason (February 27, 2018). "Oh No, Chrono Trigger Looks Awful On PC". Kotaku. Archived from the original on March 1, 2018. Retrieved March 2, 2018. ^ Hara, Ramon (March 1, 2018). "CHRONO TRIGGER Is Now Available On The PC, But Fans Are Not Happy". Game Tyrant. Archived from the original on March 2, 2018. Retrieved March 2, 2018. ^ Faulkner, Jason (February 28, 2018). "Chrono Trigger for PC is a Big Piece of Garbage". Game Revolution. Archived from the original on March 1, 2018. Retrieved March 2, 2018. ^ Oxford, Nadia (April 10, 2018). "Chrono Trigger PC Patch Improves the Graphics and Interface, But Work Remains for Square Enix". USgamer. Eurogamer. Retrieved April 11, 2018. ^ Romano, Sal (May 16, 2018). "Chrono Trigger for PC second update now available". Gematsu. Retrieved June 7, 2018. ^ Romano, Sal (June 6, 2018). "Chrono Trigger for PC third update now available". Gematsu. Retrieved June 6, 2018. ^ "Chrono Trigger for DS". GameRankings. CBS Interactive. Archived from the original on December 1, 2017. Retrieved June 7, 2018. ^ "Chrono Trigger for Super Nintendo". GameRankings. CBS Interactive. Archived from the original on December 2, 2017. Retrieved June 7, 2018. ^ "Chrono Trigger for DS Reviews". Metacritic. CBS Interactive. Archived from the original on September 26, 2013. Retrieved September 2, 2013. ^ "Chrono Trigger for iPhone/iPad Reviews". Metacritic. CBS Interactive. Retrieved June 7, 2018. ^ a b "Chrono Trigger for Nintendo DS from 1UP". ^ Pfister, Andrew (December 2008). "Timeless". Electronic Gaming Monthly (235): 84. ISSN 1058-918X. ^ Parkin, Simon (November 28, 2008). "Chrono Trigger Review". Eurogamer. Archived from the original on February 1, 2009. Retrieved January 7, 2009. ^ おオススメ!! ソフト カタログ!! : クロノ・トリガー. Weekly Famicom Tsūshin. No.335. Pg.114. May 12–19, 1995. ^ "A Magical Adventure Through Time". Game Informer. August 1995. Archived from the original on August 11, 1997. Retrieved August 3, 2011. ^ Juba, Joe (December 2008). "Chrono Trigger". Game Informer (188): 130. ISSN 1067-6392. ^ a b Scary Larry (September 1995). "Chrono Trigger". GamePro. IDG (74): 78–80. ISSN 1042-8658. ^ Herring, Will (December 2008). "Chrono Trigger review". GamePro (233): 130. ISSN 1042-8658. ^ "Chrono Trigger (DS)". GameSpy. 2013. Archived from the original on October 30, 2013. Retrieved September 2, 2013. ^ Words: Henry Gilbert, GamesRadar US. "Chrono Trigger, Chrono Trigger Review, DS Reviews". Games Radar.com. Archived from the original on June 16, 2011. Retrieved August 3, 2011. ^ Kolan, Nick (February 3, 2009). "Chrono Trigger DS AU Review". IGN. Archived from the original on March 4, 2009. Retrieved February 7, 2012. ^ "Chrono Trigger Super NES". IGN. Archived from the original on November 22, 2014. Retrieved June 15, 2016. ^ a b "Finals". Next Generation. No. 9. Imagine Media. September 1995. p. 105. ^ a b Swan, Leslie (August 1995). "Chrono Trigger review". Nintendo Power (75): 52–63, 103, 107. ^ Hoffman, Chris (December 2008). "Chrono Trigger review". Nintendo Power (236): 82. ^ Jackson, Mike (May 20, 2011). "Chrono Trigger: Square's masterpiece finally arrives in UK in its original 16-bit form". Official Nintendo Magazine. Archived from the original on October 27, 2014. Retrieved February 11, 2012. ^ Mike D'Alonzo - Posted November 25, 2008 (November 25, 2008). "Chrono Trigger DS Review for DS". G4tv. Archived from the original on January 21, 2012. Retrieved August 3, 2011. ^ "Editor's Choice Awards 1995". GamePro. No. 89. IDG. February 1996. p. 26. ^ "Chrono Trigger: A New Standard for RPGs". Nintendo Power. 73: &nbsp, 36. June 1995. ^ GameRankings staff (ed.). "Chrono Trigger Reviews". GameRankings. Archived from the original on May 19, 2006. Retrieved May 7, 2006. ^ a b IGN staff (July 4, 2001). "IGN: Final Fantasy Chronicles Review". IGN. Archived from the original on August 3, 2011. Retrieved May 7, 2006. ^ a b Wollenschlaeger, Alex (August 15, 2001). "Final Fantasy Chronicles Tops Sales Charts Six Weeks in a Row". RPGamer. Archived from the original on March 7, 2005. Retrieved May 8, 2006. ^ 読者 クロスレビュー: クロノ・トリガー. Weekly Famicom Tsūshin. No.332. Pg.32. April 28, 1995. ^ 読者 クロスレビュー: クロノ・トリガー. Weekly Famicom Tsūshin. No.335. Pg.30. May 12–19, 1995. ^ Bahamut (October 30, 2001). "RPGFan Reviews - Chrono Trigger". RPGFan. Archived from the original on March 29, 2006. Retrieved July 22, 2006. ^ Earl, Victoria (June 26, 2012). "Chrono Trigger's Design Secrets". Gamasutra. Archived from the original on June 29, 2012. Retrieved July 1, 2012. ^ Fahey, Mike (May 25, 2010). "A Visual Guide To The Role-Playing Game". Kotaku. Archived from the original on June 19, 2010. Retrieved September 12, 2010. ^ Brian Crecente (February 26, 2009). "Super Mario Kart: Most Influential Video Game in History". Kotaku. Archived from the original on February 28, 2009. Retrieved February 27, 2009. ^ Nintendo Power 250th issue!. South San Francisco, California: Future US. 2010. p. 46. ^ "Anachronox - The third leg in Ion Storm's triad may turned out to be its most underrated". Next Generation Magazine. Imagine Media. 1 (53): 36–37. May 1999. ^ IGN staff (2006). "The Top 100 Games Ever". IGN. Archived from the original on May 11, 2015. Retrieved August 8, 2007. ^ IGN staff (2007). "The Top 100 Games Ever". IGN. Archived from the original on December 3, 2007. Retrieved February 2, 2008. ^ IGN staff (2008). "IGN Top 100 Games 2008 – 2 Chrono Trigger". IGN. Archived from the original on February 17, 2009. Retrieved March 13, 2009. ^ GameSpot editorial team, ed. (April 17, 2006). "The Greatest Games of All Time". GameSpot. Archived from the original on June 16, 2006. Retrieved May 6, 2006. ^ Campbell, Colin (March 3, 2006). "Japan Votes on All Time Top 100". Edge online. Archived from the original on January 10, 2012. Retrieved October 2, 2008. ^ Ashcraft, Brian (March 6, 2008). "Dengeki Readers Say Fav 2007 Game, Fav of All Time". Kotaku. Archived from the original on August 7, 2009. Retrieved March 29, 2008. ^ "Best of the Best". Nintendo Power. Future US. 231: &nbsp, 73. August 2008. ^ "The 100 best games of all time". GamesRadar. April 20, 2012. Archived from the original on March 21, 2015. Retrieved June 30, 2012. ^ "Best JRPGs". GamesRadar. July 19, 2012. Archived from the original on January 22, 2013. Retrieved August 5, 2012. ^ GamesRadar staff (April 17, 2012). "Best Super Nintendo games of all time". GamesRadar. Archived from the original on May 11, 2015. Retrieved February 25, 2013. ^ Barder, Ollie (2018). "The Classic 'Chrono Trigger' Has Been Ported To PC And It's Not Good At All". Forbes. Archived from the original on February 28, 2018. Retrieved March 1, 2018. ^ Oxford, Nadia (2018). "Chrono Trigger Deserves Better Than This Flaccid PC Port". USGamer. Archived from the original on March 2, 2018. Retrieved March 1, 2018. ^ Kuchera, Ben (2018). "Chrono Trigger fans can't stand its PC port". Polygon. Archived from the original on February 28, 2018. Retrieved March 1, 2018. ^ Donaldson, Alex (2018). "Chrono Trigger on PC is a perfect example of how to not re-release a classic game". VG24/7. Archived from the original on March 2, 2018. Retrieved March 1, 2018. ^ Kaiser, Rachel (2018). "Classic SNES game Chrono Trigger gets godawful PC port". The Next Web. Archived from the original on March 2, 2018. Retrieved March 1, 2018. ^ "Weekly Famitsu". 1995. p. 191. Retrieved July 28, 2013. ^ Production I.G staff. 時空冒険ぬうまもんじゃ～ (in Japanese). Production I.G. Archived from the original on September 27, 2007. Retrieved September 27, 2007. ^ Production I.G staff. "Dimensional Adventure Numa Monjar". Production I.G. Archived from the original on September 19, 2007. Retrieved May 20, 2007. ^ Chrono Trigger: Resurrection staff (September 6, 2004). "Project discontinued". Chrono Trigger: Resurrection. Archived from the original on May 7, 2006. Retrieved May 7, 2006. ^ Chrono Trigger Remake Project staff. "CTRP Closes its doors". Chrono Trigger Remake Project. Archived from the original on January 27, 2011. Retrieved May 7, 2006. ^ Jones, Darran (October 2004). Games; issue 24. Highbury Publishing. p. 130. ^ Baker, Chris (February 2005). "Chrono Resurrection". Electronic Gaming Monthly. Ziff Davis Media. ^ Ragan, Jess (March 20, 2006). "Singin' the Brews: The History and Philosophy of Homebrew Game Development". 1UP.com. Archived from the original on June 29, 2012. Retrieved November 9, 2006. ^ Shoemaker, Brad (April 17, 2006). "The Greatest Games of All Time: Chrono Trigger". IGN. Archived from the original on August 30, 2011. Retrieved November 9, 2006. ^ ZeaLitY (May 9, 2009). "Crimson Echoes". Archived from the original on June 10, 2009. Retrieved May 9, 2009. ^ Chrono Fan Game: Crimson Echoes 98% Complete Leaked, Retrieved February 7, 2011. ^ Fan-made Chrono Trigger sequel finds release Archived January 31, 2015, at the Wayback Machine, Retrieved February 7, 2011. ^ "Chrono Trigger 2: Radical Dreamers". Demiforce. April 15, 2003. Archived from the original on April 29, 2006. Retrieved July 2, 2006. ^ a b Vestal, Andrew (January 6, 2000). "Chrono Cross Review". GameSpot. Archived from the original on December 3, 2013. Retrieved April 26, 2014. ^ "Chrono Cross OST Liner Notes". Chrono Compendium. December 18, 2000. Archived from the original on July 5, 2006. Retrieved July 24, 2006. ^ Kid: Radical Dreamers...!? And me name's on here, too! What the bloody hell is goin' on? ... / Kid: ......This seems to be an archive from a different time than our own. Aside from the two worlds we already know about...there may be other worlds and times which exist... Square Co (August 15, 2000). Chrono Cross. PlayStation. Square EA. ^ "GameRankings: Chrono Cross". GameRankings. Archived from the original on October 20, 2007. Retrieved July 27, 2007. ^ "Rotten Tomatoes: Chrono Cross". Rotten Tomatoes. Archived from the original on March 20, 2007. Retrieved July 27, 2007. ^ Shahed Ahmed (July 3, 2001). "New Chrono game in planning stages". GameSpot. Archived from the original on January 18, 2012. Retrieved July 1, 2006. ^ "Latest Status Info". Trademark Applications and Registration Retrieval. November 13, 2003. Archived from the original on November 23, 2005. Retrieved July 1, 2006. ^ 【ゲームな人々】第11回 長きに渡って活躍する凄腕プロデューサー　時田貴司氏(後編) (in Japanese). game.goo.ne.jp. July 16, 2003. Archived from the original on March 7, 2006. Retrieved January 15, 2008. ^ "Blue Dragon". Electronic Gaming Monthly. Ziff Davis. 216: &nbsp, 53. June 2007. ^ "Interview vidéo Final Fantasy III". Gamekyo. January 31, 2002. Archived from the original on August 7, 2011. Retrieved October 2, 2008. ^ "Top Ten Sequels in Demand". Game Informer. GameStop: &nbsp, 24–25. February 2008. ^ Parish, Jeremy (June 2008). "Retro Issue: Missing in Action". Electronic Gaming Monthly. Ziff Davis Inc.: &nbsp, 95. ^ "Famitsu Readers Vote Their Most Wanted Sequels". Famitsu. May 2009. Archived from the original on May 4, 2009. ^ Donaldson, Alex (June 5, 2009). "Square: Want more Chrono Trigger? Buy More!". Archived from the original on June 12, 2012. Retrieved June 15, 2009. ^ "Square: Obsidian Would Like To Work On Chrono Trigger". Archived from the original on July 11, 2010. Retrieved July 16, 2010. ^ "Square: Obsidian wants to make Chrono Trigger". Archived from the original on July 9, 2010. Retrieved July 16, 2010. ^ "Final Fantasy XIII-2: remaking FF7, Kinect RPGs and killing the "girly" feel". November 2011. Archived from the original on January 2, 2012. Retrieved April 21, 2013.